If you think this looks similar to an M4 GTS, you’re right. The body kit is actually an unused design proposal for the GTS by Flossman Auto Design. It’s full carbon fiber and the only one of these kits in the US, with 3 existing world-wide. It’s also sitting on HRE wheels and JRZ RS coilovers. 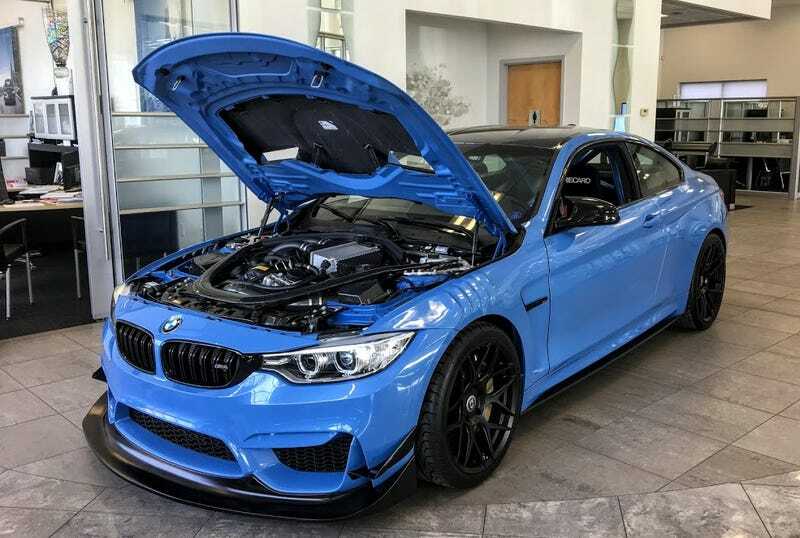 Now this isn’t some standard M4 with a body kit, this has the full Dinan Stage 3 tune, raising horsepower to a whopping 575 and increasing the torque to 560 ft/lb. That’s an increase of 150 HP and 154 ft/lbs! Additionally, the interior has been redone. Out are sound deadening and the back seats, in are the Recaro bucket seats with a 6-point racing harness, along with a half-cage that’s welded into the rear strut towers, making the car much stiffer. Thanks to the carbon fiber body kit and stripped down interior, this car has taken a 400 lb diet, bring the total to a hair under 3000 pounds. Also notice the six-speed manual, something never available on the M4 GTS. This is truly a driver’s car. Around back, we have a manually adjustable rear wing, which provides real down-force, not just racecar looks. Also notice the one-off Eisenmann center exit exhaust, specially fabricated for this car and only this car. This was to make additional room for a fully functional diffuser. Overall, a truly amazing purpose-built track car. The total cost for the build (not including the brand new M4 base car) was close to $90,000. It’s currently on sale for $129,900, which is a steal for what you’re getting: something designed to go toe-to-toe with very elite track specials, such as the Porsche 911 GT3 RS. Link for the posting here.